Vischer writes about how Veggietales came to be a household name. The first part of the book is filled with stories about Vischer’s childhood and love for making films. He talks about his Christian upbringing and the breakup of his family. He paints a picture of what it was that drove him to eventually create Bob and Larry. The second part of the book is about the fall of Big Idea, Veggietales and Phil. Phil writes with honesty and humor, even during the parts that are painful to read. 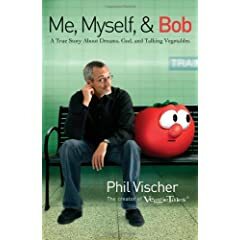 Me, Myself, & Bob is not just about Veggietales. Though you will learn why Larry only has one tooth or why he sings silly songs. Me, Myself, & Bob is also about God. More specifically it is about learning from what God did in Phil’s life. There are lessons to learn and emotions to be dealt with. 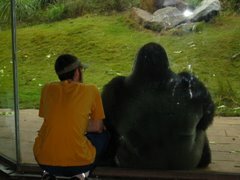 I found myself stopping to consider how the truths Phil was sharing fit with my relationship with God. If you enjoyed the funny writing found in the Veggietales videos, you will enjoy the writing inside the pages of this book. Each page is full of openness and transparency laced with humor. If you have ever wondered why God would allow Big Idea to come crashing down into bankruptcy, destroying jobs and countless families who lost jobs, then you will want to read this book. This book takes you on a journey to discover one reason God would give you a dream and then take it away. Do you have a dream? If so, you will want to listen to Phil Vischer tell you his story about a dream and a God much bigger than that dream. too much TV for teens?